AUTHOR: NEF Consulting team and reviewed by Samra Mariam, Senior Consultant, NEF Consulting. Monetary valuation of social and environmental outcomes, as applied in methodologies like Social Return on Investment (SROI) and Social Cost-Benefit Analysis (SCBA), has become an increasingly common approach for organisations who want to understand and clearly articulate the change they create. Valuation is useful because monetisation allows us to compare things which are very different by providing a common ‘metric’ or unit of measurement (£s, $s, €s) for comparing social, environmental and economic outcomes both against each other and against investment costs. However, valuation is often one of the most challenging aspects of such a socio-economic analysis and is not necessarily feasible or desirable for all projects or programmes. Where such approaches are not appropriate, the use of composite indicators presents an alternative approach. With it, we can side-step valuation while still aggregating across different outcomes through a common unit of measurement, as well being able to integrate benchmarking data where it is available. Composite indicators work particularly well for measuring wellbeing because their structure can accommodate the complexity of the concept. They work like a loom, weaving together strands of different colours into a coherent picture of wellbeing. 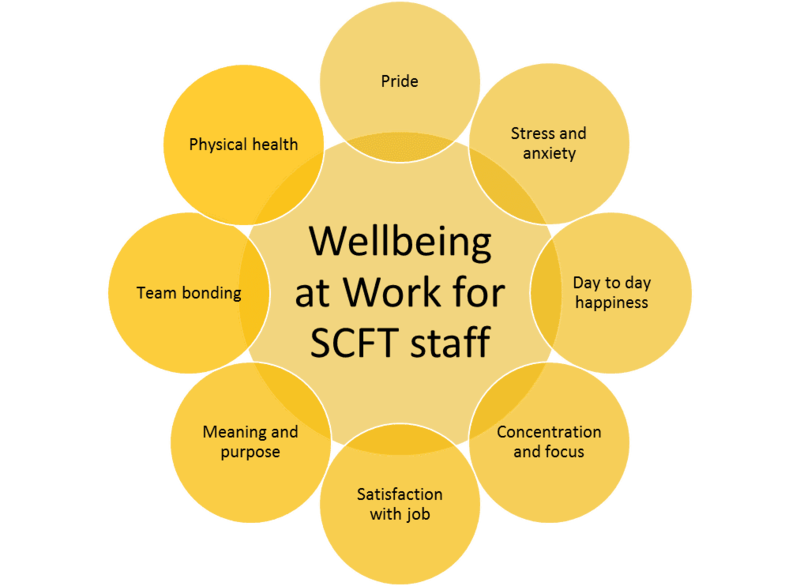 In 2016, we developed a wellbeing index for Sussex Community NHS Foundation Trust (SCFT) as part of a triple-bottom line assessment of their Care Without Carbon campaign. The campaign asks staff to sign up to particular ‘Dares’ – challenges to integrate into their working day which might make that day a little nicer. This element of our assessment was about measuring the impact of the Dares on staff wellbeing. The index was designed to also measure staff wellbeing across the Trust. We carried out Theory of Change workshops with SCFT staff at several sites across the Trust. These were designed to understand what wellbeing at work meant to staff, and which of its aspects they felt the campaign had affected. The elements identified by staff are represented below. We developed a survey which the Trust distributed to staff over the spring and summer of 2016. The survey measured changes across these different components of wellbeing. When we compare changes across different (subjective) aspects of wellbeing, a common metric is useful. If, as the result of an intervention, a respondent changes their self-report from a 4/10 to a 6/10 on ‘Pride’ and ‘Team bonding’, what does that mean? What does it mean to be ‘6/10 proud’? Is 6 a high score, or a low one? To address these issues, we adapted a methodology developed by the New Economics Foundation’s National Accounts of Wellbeing which uses external data sets (benchmarks) to standardise individuals’ responses to surveys in relation to the distribution of the benchmark data. Individuals’ scores were converted from being absolute scores they had given themselves to relative scores which placed their self-reported scores in relation to other people’s. Scores are then converted to a scale of 0-10, where a 0 puts a person at the bottom of the distribution, 10 at the top, and 5 at the national average. This gave our wellbeing outcomes a common unit of measurement, making it easier to compare the impact of the campaign between outcomes. It also allowed us to create an aggregate score for overall wellbeing. With support from NEF Consulting, the Trust ran the survey again in 2017, allowing them to compare changes in staff wellbeing across the two years. From this, the Trust is able to understand the shifting picture of wellbeing: how overall levels of wellbeing are changing, and which components are driving that change. The above example shows how composite indices can be an invaluable tool for organisations to tell a richer story about impact and change over time, particularly when, like wellbeing, the story is around a concept with many strands. You can read more about the Sussex Community NHS Foundation Trust’s campaign on their website at carewithoutcarbon.org or download their full report here: cwc-impact-report. 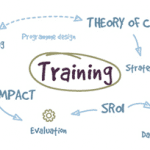 We offer training on both Theory of Change and on measuring and improving wellbeing.